The Super Plush Microfiber Trio includes the Super Plush Microfiber material in three different sized towels at one great value! The 16 x 16 inch Super Plush Junior Microfiber Towel is perfect for easy handling. The 16 x 24 inch Super Plush Deluxe Microfiber Towel has increased surface area for when you need it. The massive Super plush XL Microfiber Towel measures a whopping 25 x 36 inches, which makes it an excellent drying towel to ensure a streak free shine. The Super Plush Microfiber Trio includes all three of these excellent towels. The tremendous weight of the fabric makes the Super Plush Microfiber material very thick and soft. Your hand sinks into the fluffy, silky fibers. 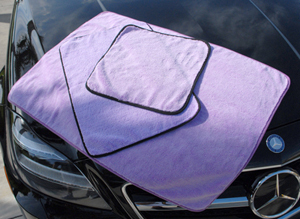 The Super Plush Microfiber material caresses your vehicle�s curves as you buff off waxes, spray waxes, and detailers. The Super Plush Microfiber Trio includes three of the thickest, softest microfiber towels for all your detailing needs. 1 Super Plush XL Microfiber Towel, 25 x 36 inches A total retail value of $45.97. You save $5.98!